Fulton, NY – Catholic Charities of Oswego County’s Step By Step Wellness Program has established new hours for the fall that will make it easier for community members to access its services. 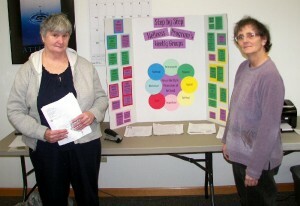 Dana (left) and Maureen, clients with Catholic Charities of Oswego County’s Step By Step Wellness Program, review the list of upcoming programs and groups offered at Step By Step. Using a wellness recovery model the Step By Sep Wellness program provides an array of services to adults diagnosed with a mental illness and assists them in their recovery. Located inside Catholic Charities offices at 365 W. First St. the Step By Step Wellness Program is now available Monday, Wednesday, Thursday, and Friday, 9 a.m. to 3:30 p.m., and Tuesday from 11 a.m. to 6 p.m. The Step By Step Wellness Program uses a wellness recovery model that provides services to adults diagnosed with a mental illness. The Step By Step Wellness Program offers a variety of programming to support clients with their recovery, promote wellness, and combat the stigma of mental illness. The programs help individuals increase their self-esteem, establish group affiliations, and maintain independence in the community. Additionally, a peer generalist provides person-centered recovery-services for clients through individual and group-based support and serve as an advocate for clients by assisting with the access of appropriate services and with communication between clients and other service providers who may help them achieve their goals. To serve clients in the northern part of Oswego County, the Step By Step Wellness program is available weekly on Mondays from 10 a.m. – 2 p.m. at Rural and Migrant Ministries, 15 Stewart St. in Richland. Workshops and other programs are open to all clients. Catholic Charities of Oswego County serves all people in need regardless of their religious affiliation. Primary funding sources for Catholic Charities of Oswego County’s programs are the United Way of Greater Oswego County, the Diocesan Hope Appeal, the County of Oswego and private donations by individuals and local companies and organizations.